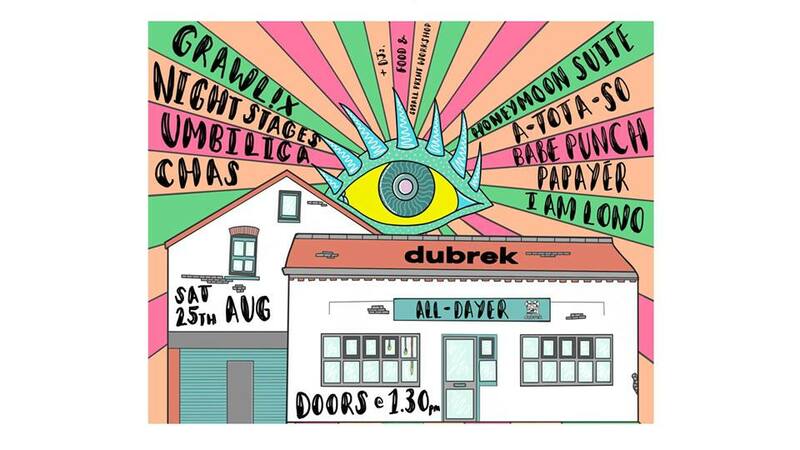 Find us literally up the road at our good neighbours, Dubrek, for some Bank Holiday fun! Free Entry – Donations gratefully received on the day for bands. + FOOD, DJs & The Smallprint Company will be running a traditional letterpress workshop. FIRST ACT ON AT 2PM – SO GET DOWN EARLY SO YOU DON’T MISS OUT! Umbilica – Beautiful songs and poems by Josephine Lewis. Night Stages – Psychedelic Post-Punk – It’s their first gig too! Grawlix – Incredibly hypnotising Dream-Pop. a-tota-so – Longtime Dubrek residentials – Instrumental Math Rock done extremely well! BABE PUNCH – Everybody’s favourite Alt-Pop-Punk 4 piece. Papayèr – IT’S BEEN SO LONG! Good to see these Alt-Indie lovelies back in Derby. I AM LONO – Post-Punk, Synth-Rock from Nottingham.